The Ultimate Lube for SPL U-Joints, Slip Yokes, and Slip Joints. You’ve placed your trust in SPL u-joints, slip yokes, and slip joints. Don’t skimp on the lubrication that keeps everything running smoothly. Genuine Spicer ultra-premium synthetic grease is the only synthetic lubricant that meets the exacting standards that have made Spicer the name people trust. Compatible with all NLGI-2 greases, Spicer ultra-premium synthetic grease delivers professional-grade quality. Increase Bearing Life by More Than 30%. Available in 10-packs of 14-oz. tubes or 1-gallon tubs. Spicer ultra-premium synthetic grease is available in 10-packs of 14-oz. tubes (SPL 1051) or 1-gallon tubs (SPL 1052). 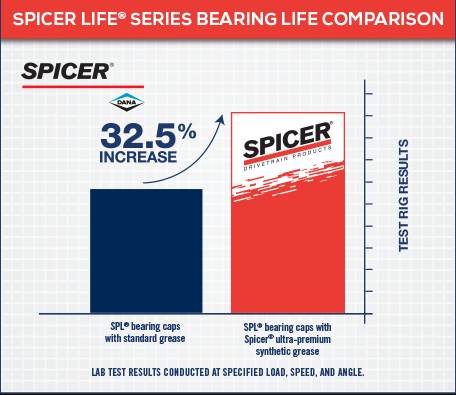 It’s part of a complete line of lubricants manufactured to meet the exact specifications of genuine Spicer products. Learn more about Spicer ultra-premium synthetic grease by downloading the information on the right. Then find dealers who offer Spicer lubricants near you.